The Bathurst 1000 is a 1,000 kilometre touring car race held every year on the Mount Panorama Circuit, in Bathurst New South Wales, Australia, Oi, Oi, Oi. During the off season, the circuit, is actually open to the public, driven daily by locals and tourists alike. It is currently run as a championship event for V8 Supercars and is known as “The Great Race”. This year in 2016, the 58th race was held, and the 1st place finisher was Will Davison and Jonathon Webb in the Tekno Autosports Holden Commodore. The lads gained 16 positions out of 27 cars. 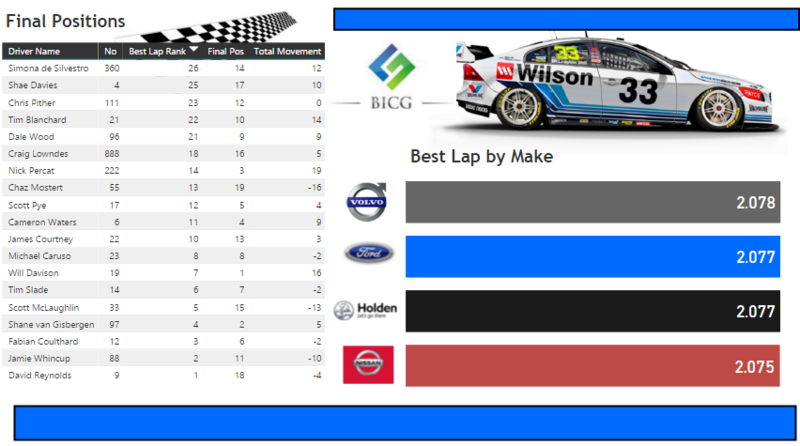 Whilst I’m pleased with a Holden win because that makes my Dad happy, a quick run through the figures in Microsoft Power BI shows remarkable performances by the only Female Team, drivers Simona De Silvestro and Renee Gracie and by Nissan Motorsports. 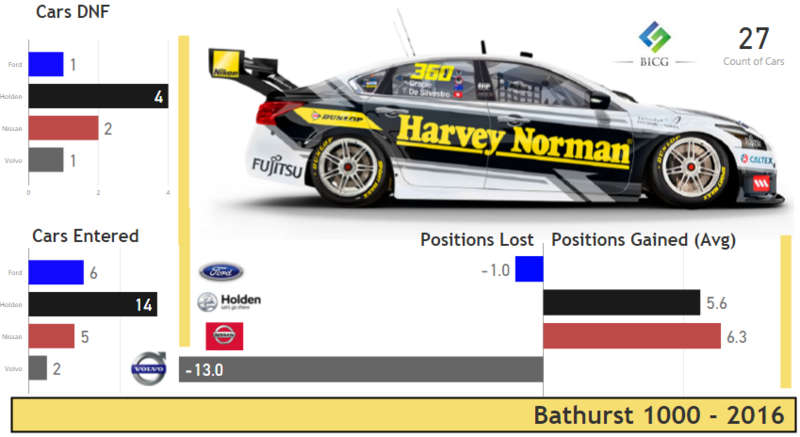 Nissan Motorsport outperformed all manufacturers with the best Average Number of Positions gained and the best Average of all Fastest Lap Times recorded. Female Drivers De Silvestro and Renee Gracie, whilst having one of the slowest Best lap times recorded, gained 12 positions throughout the race, starting from near last place, and that was all without their cool suits working. That’s a go for the Girls and Nissan Motorsport, but a shame for Volvo !